A Conservancy Building is being erected for environmental education. When open, it will provide outdoor classroom activities for schools and the community. Participants will have the opportunity to spend relaxing time in a beautiful natural setting and to learn about such vital concepts as climate change, energy conservation, alternative sources of energy, recycling, the ecological importance of woodlands and wetlands, and the need for better ecostewardship of our natural resources. Public forums on topics of environmental concerns are being planned, with national and international speakers featured. Also planned are primitive camping cabins, which will allow weekend or week-long courses of study. The facilities will not be rented out for general use, but will be used for environmental education programs only. Community groups wishing to pursue environmental topics (such as interfaith ecostewardship, etc.) are welcome to coordinate programs with the Conservancy staff. 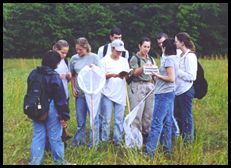 We will be offering field trips for school groups begining in Fall, 2009. Please browse all pages to see photos of the conservancy and be sure to click on the photos to see larger ones!